Feng shui bagua (also called ba-gua or pakua) is one of the main tools used in feng shui to analyze the energy of any given space, be it home, office or garden. 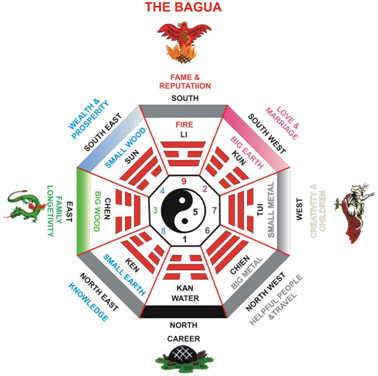 Basically, bagua is the feng shui energy map of your space that shows you which areas of your home or office are connected to specific areas of your life. In order to successfully apply feng shui in your home or office, you need to define the bagua, or the feng shui energy map of your space. Once you have the compass reading and the floor plan of your space, you can easily define the bagua. This will show you the location of different feng shui areas in your home or office. 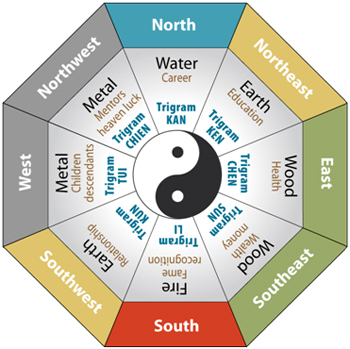 Each of the 8 feng shui areas, or directions, has a specific feng shui element, feng shui color, as well as life area connected to it. Feng shui can bring the desired changes into your life only when you know the bagua, or feng shui energy map of your home. Once you have defined your bagua, you know which areas of your home need more attention in order to improve specific areas of your life, be it love & marriage, wealth, career, prosperity or health & mental peace. In order to successfully apply feng shui in your home or office, you need to define the bagua, or the feng shui energy map of your space. Under mentioned are helpful tips to choose the right bagua for you, find out how to define the bagua in your home or office, as well as help you deal with the bagua specifics, such as missing areas or extensions, bathrooms, toilet, beams, columns etc. basic tool used in feng shui to learn which parts of a space–-such as a home, office building, room or yard–correlate with particular areas of life. Represents: Recognition, reputation, and fame. Represents: Helpful people, mentors, and networks. Represents: Knowledge, education, and learning. NORTH sector is connected with water element which is for career and opportunities. North part of the home and work place plays a vital important role, if this sector is disturbed due to Missing Area, toilet, bathroom, kitchen, staircase, heavy objects, Septic tank, overhead tank, Unwanted Clutter etc. Affects our Career and opportunities, For all those working in corporations, big companies or just employed, this is the right sector to activate. This sector is produced by metal so either water or metal energy here is very lucky. If you want new opportunities and you like symbolism, statues or paintings of horses, Crimson Phoenix Bird etc… symbolically brings fame and recognition. Since this is a fire sector, wood like plants strengthen this sector as well. EAST sector is connected with Wood element which is for – Health & Growth This is the corner of your house which stands for the overall Health of the family and also reflects the general well being and harmony. This sector is filled with a lot of growth energy so it is a good place for children, especially eldest son. The East is also the direction that corresponds to the eldest son and heir of the family. if this sector is disturbed due to Missing Area, toilet, bathroom, kitchen, staircase, heavy objects, Septic tank, overhead tank, Unwanted Clutter etc. it could also create obstacles to the success, sometimes it also causes lack of a male heir in the family. Good health is very essential for a happy life, sometimes we do not realize it until we loose it. Only then do we start realizing how important health is. This is a wood sector so this is a very good place to put Healthy plants and trees here. Water is recommended as well. WEST sector is connected with Metal element which is for –descendants - Children’s luck, Creativity. If this sector is disturbed due to Missing Area, toilet, bathroom, Septic tank & Underground Water tank, Plants, Unwanted Clutter etc. It could also create obstacles In Conceiving and fertility problems. If you like symbolic objects, you can place here all the fertility symbols, for example: crystal lotus, painting of 100 children etc. This is a metal sector. This is a sector good for Creativity, children and older people. it is beneficial to place a pink lotus made of crystal in this part of the home. SOUTHWEST sector is connected with Earth element which is for – sector of the mother of the home and sector of relationships and love & Romance. for some reason you can’t find a girlfriend or Boyfriend, Marriageable partner or you have relationship problems check if your SW is not missing or Affected. If this sector is disturbed due to Missing Area, toilet, bathroom, Unwanted Clutter, Wrong Paintings, etc. Creates instability in Business and Career, Quarrels and differences of opinion in the family. Activate this sector with lights, Rose quarts Mandarin Ducks Pair, Twin crystals-30MM, Mystic knot & Double happiness Frame etc. NORTHWEST sector is connected with Metal element which is for – sector of the Head of the family (very important sector), and sector of mentors and helpful people. If you need help from influential people, activate this sector. If for some reason you are still single lady maybe this sector is Affected by a Missing Area, kitchen or toilet. If this sector is disturbed due to Missing Area, toilet, bathroom, Unwanted Clutter etc… affects Marriage , Helpful people and travel, Creates Confusion & indecisiveness This is a metal sector so Fire Should be avoided in all means, so place a lot of metal element objects here. If this sector is disturbed due to Missing Area, toilet, bathroom, Heavy Weights, Unwanted Clutter etc. Energies flowing out from this corner is what brings the luck, personal growth, Knowledge and wisdom Gets Affected. This is an earth element sector, so place bright lights here or use red color scheme. Bunch of 8 Crystals are excellent here , Crystal / Lapiz Lazuli globe, Pebbles, Pyramids etc. SOUTHEAST sector is connected with Wood element which is for – Financial Growth, Money & wealth. If you want money and wealth, activate this sector!!! If this sector is disturbed due to Missing Area, toilet, bathroom, Heavy Weights, Unwanted Clutter etc. it results in to stoppages, money gets stuck, outstanding gets higher and higher day by day and heath of the family deteriorate etc. In the destructive cycle of the five feng shui elements Metal cuts the Wood and Fire burns the Wood. As your focus is to strengthen the Wood feng shui element energy of the Money area, it is best to avoid the elements that weaken the Wood. You can strengthen the Wood feng shui element of the Money area with Healthy lush green plant, A beautiful water feature (actual or an image, You can also add the colors of Earth, as Earth supports the Wood element.